Our next Heroes of the Storm Technical Alpha patch will bring a number of changes to the out-of-game Leveling System, Hero Quests, Player Profiles, and much more. Many of the changes that we’ve decided to include in this patch were made entirely because of the feedback that the Heroes community has shared with us on the official forums. Thank you very much for your help during Tech Alpha testing thus far; we’re looking forward to hearing much more from all of you in the future so that we can continue to make Heroes the best game it can possibly be. For now, we’d like to make sure you’re completely prepared to level up and earn rewards come patch day. Let’s take a look at some of the major features that have been reworked in the next Tech Alpha patch, starting with the new Player Profile layout. 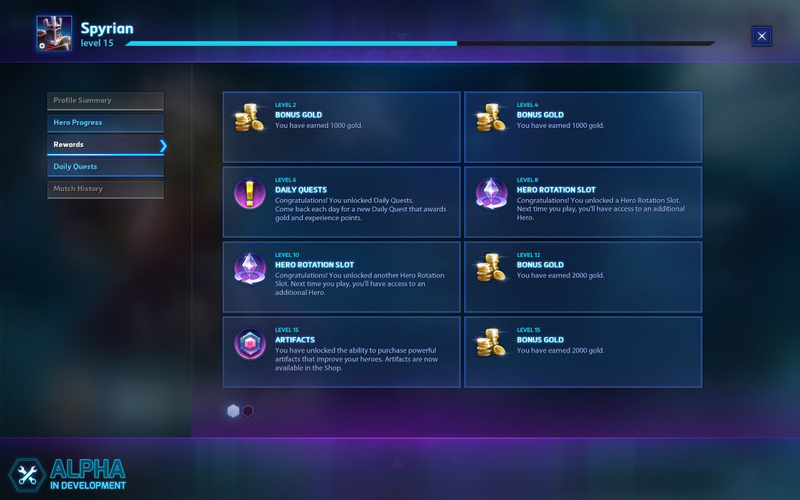 Upon logging in to Heroes of the Storm once our next Tech Alpha patch is released, you’ll immediately notice that the Leveling System progress bar and reward icons have been removed from the home screen. Never fear, they haven’t gone far! They’ve just found a new home in the freshly revamped Player Profile screen. Access your Player Profile by clicking the Hero portrait found in the top right corner of the home screen. Once you do, you’ll see your current player level and Hero portrait are now located at the top of the profile screen, and several tabs have been added to the left-hand side which can be used to navigate the your profile. Use this tab to track of the Experience Points and Rewards you’ve earned by playing games with each Hero. Here, you’ll be able to see which Leveling System Rewards you’ve earned, as well as those you have yet to unlock. Select this tab to keep an eye on which Daily Quests are currently available to you. Profile Summary and Match History Have been disabled during Tech Alpha testing. 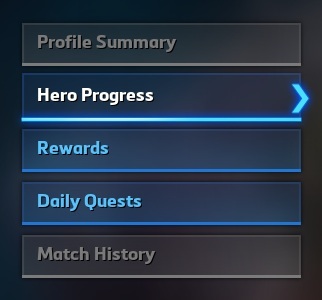 In our next patch, the Hero Quests tab has been renamed Hero Progress, and Hero Quests have been replaced by Hero Levels. The Hero Progress tab is where you’ll be able to keep track of each Hero as you earn XP, level them up, and unlock new rewards. In previous versions of the game, Hero Quests could only be completed by playing in Versus games. Thanks to your feedback, however, that restriction will soon be a thing of the past. Once the patch is released, the experience points you’ll receive after playing games in Cooperative and Versus modes will not only count toward your overall player level, but carry over toward progress and rewards for the Heroes you use during those matches, as well. Better still, you’ll no longer need to reach player level 10 with the Leveling System in order to start leveling up your favorite Heroes. Instead, you’ll begin earning XP toward Hero progress with your very first game -- Even if you’re starting from scratch with a brand new account! Following the patch, each Hero will begin with one Heroic Ability, and the second can be unlocked by reaching Level 2. Talents are no longer completely unlocked for all Heroes at once by achieving player level 8. Instead, each Hero begins with two Talent choices available at each tier of in-game Talent selection. Six additional Talents, one for each tier, can be unlocked by reaching Hero Level 3. All of a Hero’s remaining Talents will become available at Hero level 4. Hero Portraits are now unlocked on an individual basis by reaching level 6 with each Hero. Upon reaching Level 9, you’ll unlock that Hero’s Master Portrait, which features a shiny golden border. At levels 7 and 8, you’ll unlock Skin variations. With these, each Skin you own (including a Hero’s base model) offers three different options for customizing the look of your Hero in-game, for free! Mount variations will unlock at Hero levels 6 and 9. Much like Skin variations, Mount variations allow you to customize the steeds you ride into combat. 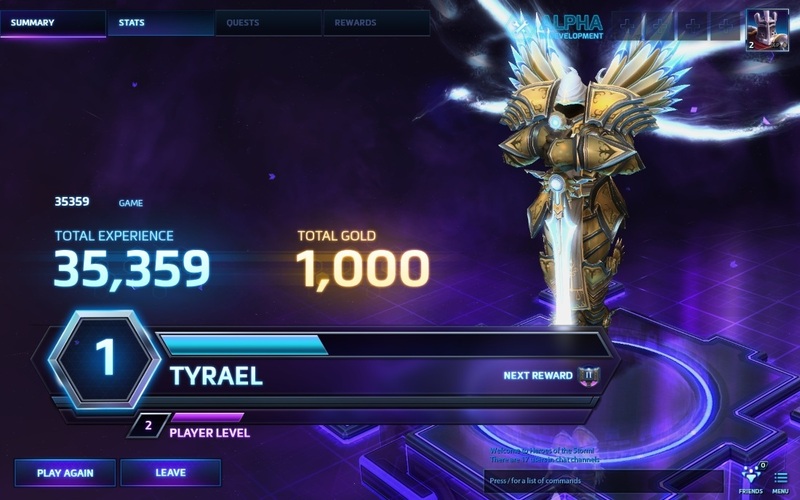 At level 10, you’ll unlock the ability to purchase a Hero’s Master Skin with Gold, which you can use to show off your prowess with that Hero in-game. Just like other Skins, a Master Skin features two variations, which you’ll have already unlocked by reaching level 10. This means that once you’ve purchased a Hero’s Master Skin, you’ll immediately be able to use its variations in-game. It is also important to note that any Hero Quests which are completed prior to our next patch will count toward Hero Levels, but partial Hero Quest progress will be lost. For example, if a Hero’s first Quest is already complete prior to the patch, that Hero will begin at level 2. If all six of a Hero’s Quests are completed, that Hero will begin at level 7. Additionally, if a Hero’s second Quest was only halfway complete prior to the patch, progress will be reset, and that Hero will begin at level 2. 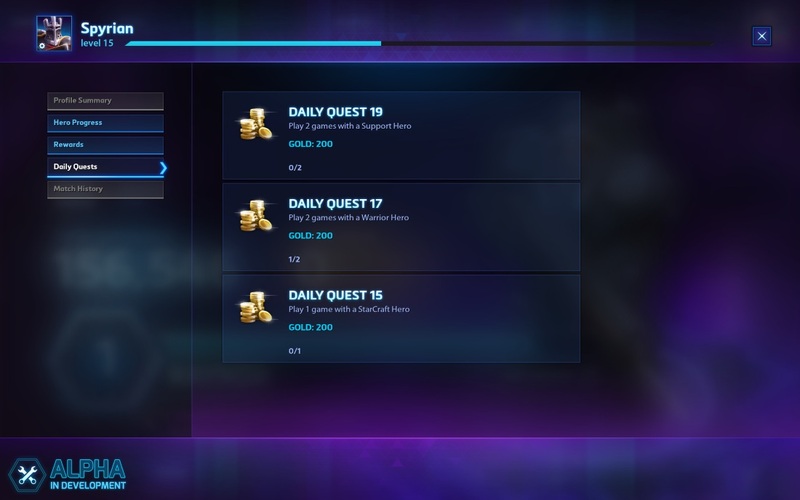 Taking a look at the Rewards tab above, you can see that our next patch will bring a host of changes to Leveling System Rewards in Heroes of the Storm. As before, you can still earn Gold by leveling up, and you’ll receive 1,000 Gold for reaching levels 2 and 4. We’ve also made a few changes to the rewards unlocked at levels 8, and 10. Not only have we moved the free Hero rotation slot reward from level 7 to level 8, but we’ve also added a second slot that you can unlock by reaching level 10. This means that you’ll be able to choose from among seven free rotation Heroes for any given game, at any time! Additionally, we read feedback from a number of players who mentioned that they’d like to see rewards added above level 10, so we’ve added a 2,000 Gold reward to level 12, and levels 20, 25, 30, and 35 now offer 3,000 Gold each! You may have also noticed an “Artifacts” reward pictured at level 15 above, but we’ll have much more information to share on that in the coming days. Kindly note that all partial progress made toward the next player level prior to patch day will be lost. For example, if you were halfway toward reaching player level 21, you will be reset back to the start of level 20 following the release of our next patch. Let’s take a look an exciting new way to earn Gold in the next Tech Alpha patch. Many of you who frequent our forums have mentioned that opportunities to earn Gold in Heroes felt rather infrequent at times. We definitely heard your feedback, and after the patch, you’ll receive Gold for completing matches in Cooperative and Versus game modes! Every Cooperative game you win will award you with 10 Gold; while Versus games will net you 10 Gold for losses, and 40 Gold for wins. What’s more, quite a few of you have also let us know that you’d like the ability to complete Daily Quests outside of Versus matchmaking. We’re happy to share that, thanks to your comments, you’ll be able to progress toward and complete Daily Quests in both the Cooperative and Versus game modes alike after the patch. In order to help account for this change, we’ve decided to slightly rebalance the amount of Gold awarded by Daily Quests. Rather than offering 250 or 500 Gold on completion, all Daily Quests after the patch will instead award 200 Gold. After completing a game in any mode, you’ll land directly on the Summary page, which is where you’ll be able to see the fruits of your labor from your most recent game. All of the experience points and Gold you earned from your most recent match, as well as any rewards you’ve unlocked, will be counted up and detailed for you in the center of the screen. 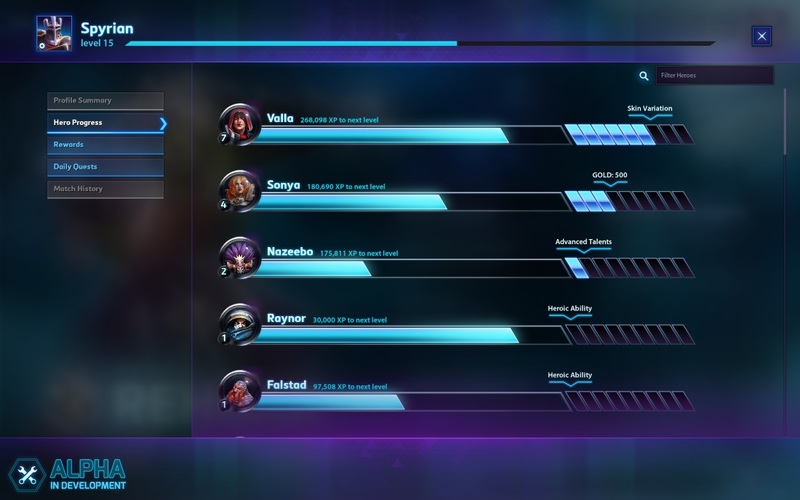 The large blue progress bar keeps track of your Hero’s current level, the XP you earned toward the next Hero level, and displays your next Hero level reward to the right. Similarly, the purple progress bar tracks your current player level, the XP you’ve earned toward your next level, and displays your next player level reward to the right. If you’re ever curious about which reward is coming up next, hover the mouse over the reward icons to the right of each progress bar to get a brief description. The Stats page is essentially the end-of-game Score Screen you’ve become familiar with in previous Heroes of the Storm builds. Much like before, you’ll still be able to see Takedowns, Deaths, Battleground Mechanic scores for each player, as well as elapsed game time, and XP earned during the previous match. The Quests page offers another a look at all of the Daily Quests that are currently available to you in case you’d like to quickly check out which Quest to complete next before hitting the Play Again button in the lower left corner of the screen. The Rewards page displays all of the rewards you earned during the previous match. That just about does it for our Progression System and reward changes in the next patch. Thank you once more for helping us test during this phase of the Tech Alpha. Your constructive input over the past few weeks has gone a long way toward helping us shape the changes we made for the impending patch. If you’d like to share more of your thoughts with us, be sure to drop by the Heroes forums and contribute there. Stay tuned right here at HeroesoftheStorm.com over the next few days to catch more exciting information about what’s coming to the Technical Alpha. Finally, don’t forget to drop by our live Developer Insights broadcast, starting at 11:00 a.m. PDT on Tuesday, July 22. If you’d like to submit a question for the Q&A portion of the show, kindly submit your queries to @BlizzHeroes using #HeroesQA on Twitter.